Not since Thoreau took us to Walden Pond has there been such an important work on the natural world. 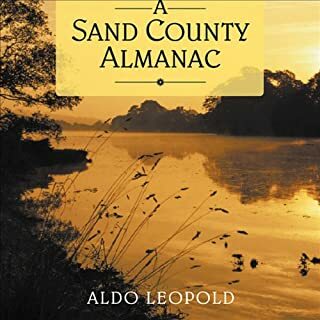 A Sand County Almanac is Aldo Leopold's simple expression of feeling for the environment at his weekend farm along the Wisconsin River. It is an inviting, gentle world - one that is rapidly disappearing. This Audible book is abridged. I am not sure what parts of the original are missing, but any gaps were unnoticeable. The book was still very enjoyable and great listen for a daily commute. The essays are arranged in order of months of the year (hence an "almanac"). Each set of essays address the natural events of that season, which take place around the author's farm, in the flood zone of "Sand County". The essays differ in style, some more poetic, others more prose, but all are designed to be enjoyable for any listener/reader. However, embedded in every essay is a wealth of insight into the habitat and behavior of wild animals. Although cleverly disguised as the casual glance of a poet strolling through the woods, the stories are actually the result of many years of careful observation and scientific research. When written, this book had a significant impact on wildlife biology, ecology, and the conservation of natural resources in the United States. It's value has not diminished over the years, and still worth the listen. Maybe you will see just a little more during your next stroll through the woods. Utterly beautiful. Profoundly disconcerting. Quantum theory is quite simply the most successful account of the physical universe ever devised. Its concepts underpin much of the 21st-century technology that we now take for granted. But at the same time it has completely undermined our ability to make sense of the world at its most fundamental level. 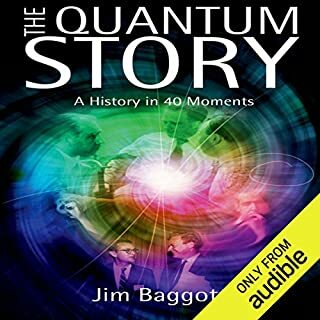 Although, the title on one of the downloads is mislabeled as "40 Minutes" -- these "40 Moments" last for 15 1/2 hours in the audible format. That is a lot of listening for one credit, but worth the time if you have any interest in science, physics, space, or time. The author covers the struggles, over more than a century, to understand opposite ends of our "normal" perception of reality -- the extremely small and extremely huge -- the structure and physics of atoms and the universe. The book is well read, so you can ignore the formulas and still capture the major concepts, even if you are not a physicist. I would not have tackled this content in written form, but it was enjoyable in audio. [If you are a physicist, you might also want the hard-copy book for the references and all the formulas (which are not as simple as e = mc**2).] This book provided me an appreciation of how difficult it was (and still is) for the geniuses to figure this stuff out. I discovered that the science, which my high school and college professors often presented as "facts," ended up being "false", questionable, only one of strong competing theories or opinions, or an over-simplification of reality. However, the "final answer" is not included in the book, since it has yet to be discovered. Georgio Vasari's original vision of the arts was to see the artist as divinely inspired. He describes the lives of 45 artists, including Giotto, Brunelleschi, Fra Angelico, Botticelli, da Vinci, Raphael, Michelangelo, and Titian, with striking immediacy conveyed through character sketches, anecdotes, and detailed recording of conversations. This is an "Unabridged" reading of an "Abridged" translation of the original work. The fact that the reading is not the "complete" work of Giorgio Vasari, is not necessarily a negative observation, since the abridged version is over 18 hrs long. The original book was published several times during Vasari's life, as he added more artists or edited previous content. The English translator, George Bull, has selected some of the most historically "important" artists to include in his translation. His translation seems to capture the humor and attitude of Vasari. Compared to a number of public domain translations I sampled, it was definitely a more interesting read.This book is available in print, but I would never have tried to read this book cover to cover, due to its length (plus all the Italian names and the quoted Latin). However, the reader made listening enjoyable as I commuted (many days) to work. To some, this book is significant as the archetype for art history or commentary. 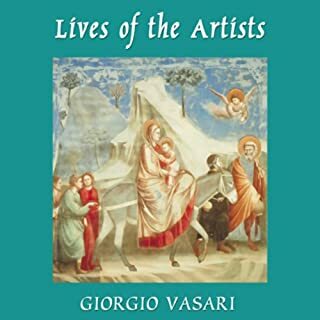 However, the reader/listener benefits from Vasari's perspective as a fellow-artist and contemporary of a number of the artists he writes about. It is obvious that Vasari's "political agenda" is to increase the stature, appreciation, and respect for all artists -- and Vasari does become repetitive in his praises of the works of the best artists. However, the listener gains an appreciation of the unique circumstances that enabled art to flourish in the Renaissance, but also how artist had to rediscover the basics lost in Greek and Roman times. As Vasari comments on what is included or omitted from the works of other artists, he also teaches art foundations. He demonstrates how later artists benefited from those who came before them. Many of his opinions have stood over time (although some historians argue the details). As with most Audible books, it would have been helpful to have bookmarks that aligned with chapters and artists.